Search for sales associates who have shown listings comparable by price, MLS area, zip code, etc. This report is a great resource to help listing representatives locate potential buyers for their listings. Presents a dashboard view of active and pending/under contract listings. This report provides a great way to see the total number of showings, prices and expiration dates for each listing. Review all activity details for the life of each listing. 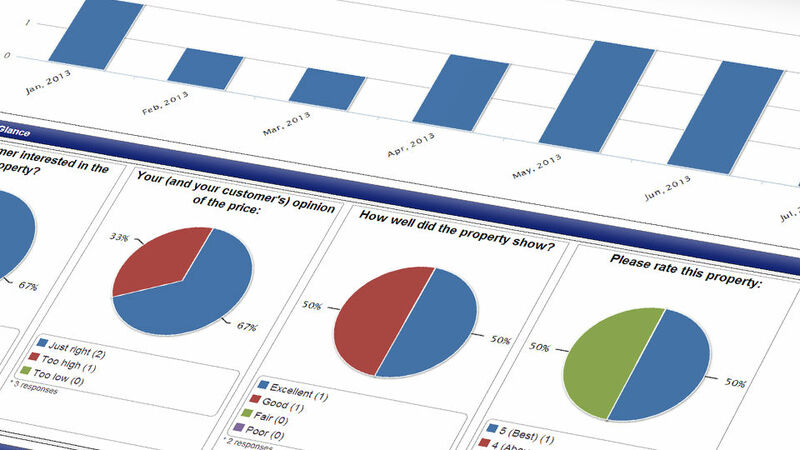 You can easily review feedback from showings, document open houses, advertisements or other events and display basic information that can be printed and shared with sellers. You can even market the listing from this report by sending out a group email to showing representatives who have brought buyers to the listing, notifying them of an upcoming open house or recent price adjustment. This graphical report displays which price range is getting the most showings. It’s a perfect report to share with sellers when determining the starting price for a listing or making a price adjustment. This report of all agents (and staff personnel) in your office shows an alphabetical list of names, extension, home phone and other telephone numbers. View all of your agent’s showing activity across all companies within your market. During company meetings, office representatives can use this report to easily display listing activity for all of the office’s listings, such as total new listings taken, price changes, status changes, total showings and listings nearing expiration. Displays all the office’s listings and the number of showings each listing has had to date. It can be easily sorted by listings that are active or listings that are pending/under contract. Office representatives can use this report to review seasonal trends for selected time periods. It is perfect for viewing total listing activity such as total new listings taken, price changes, status changes, and total showings for a given month. Displays the total number of listings that sold, and the average number of showings that occurred prior to each sale. This report is ideal for helping offices win listings from sellers, presenting the office as the market experts. You can even review the average number of showings for the first six weeks a listing is active. Heavily used for recruiting, this report displays the top agents in your entire market showing your office’s listings. It also displays the top offices in your market showing your listings, as well as the top listings in your office getting the most showings. This report provides a comprehensive summary of Showings related information for each of your listings.